Considering the numerous health risks and resulting costs, addressing smoking in communities is vital to effective social investment. The CDC estimates that 1 in 5 deaths are attributed to smoking related complications. More than 90% of all lung cancer cases and more than 80% of all chronic obstructive pulmonary disease are attributed to smoking. 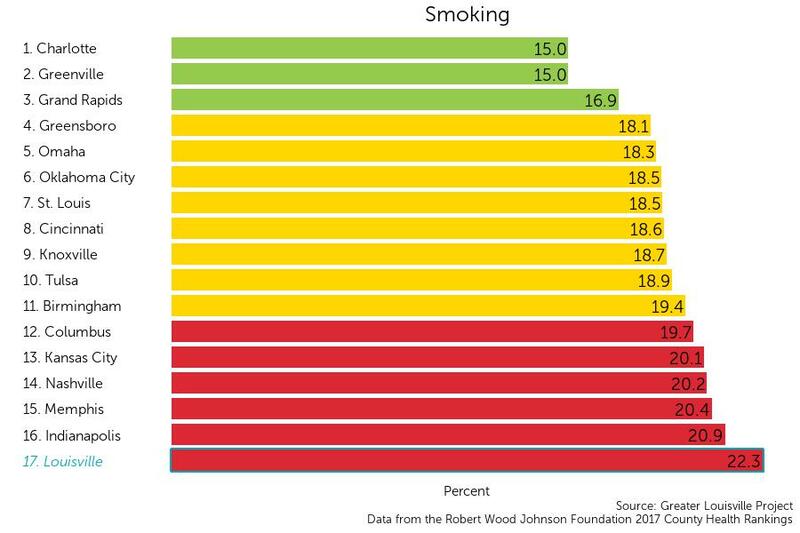 Louisville currently ranks 17th among its peer cities in rates of adult smoking with 22.3% of adults smoking cigarettes. On this metric, Louisville is in the bottom tier of its peer group according to a natural breaks algorithm. Cities in green are those that outperform their peers, cities in yellow represent the middle cluster, and those in red are a group that lags behind its peers on this indicator.